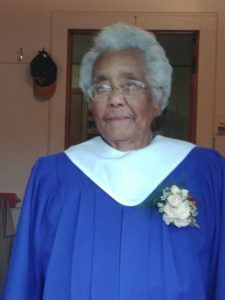 Hazel Johnson was presented with her High School diploma at Thursday nights Grade 12 graduation ceremony at Bridgetown Regional Community School! 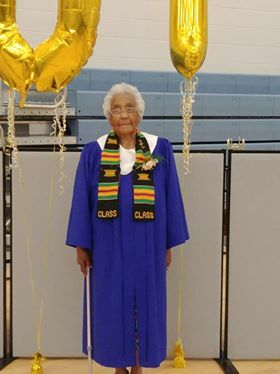 The one regret the 99 year old grandmother had was never walking across the stage! Congratulations Hazel! Enjoy your summer break! to Mary Anne and Jessie Mitchell. a deacon of the church to this day. told that the school was using new text books, so she needed to buy new ones. other countries she traveled to so, just she could be courteous. retired to Inglewood where she lives today. now she is a great-great grandmother of a 7month old boy. chefs you will ever meet! brought home“every ribbon in the Annapolis Valley Exhibition”. and Sudokopuzzles in the Chronicle Herald, these are her daily brain exercises. and is an avid consumer of the news. let her life circumstances stop her education, she worked around it.